The Lee Clan: Jodi's Very First Field Trip! On Thursday Jodi was able to go on her very first field trip. She was so excited, and she asked that her Daddy go with her. 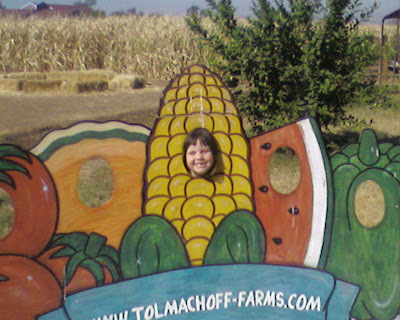 They went to Tolmachoff Farms. 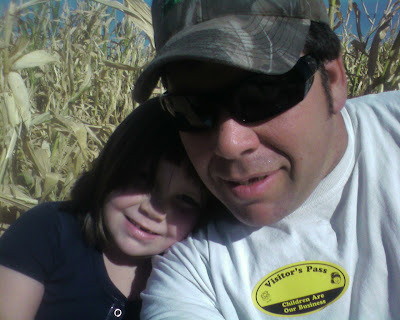 They got to go through a corn maze, and learned about farms. Jodi even picked vegetables and was able to bring home what she picked. She will not let us eat the carrots, cucumber, radishes or even her zucchini. Jodi is now telling us that we need to plant a garden. (Jared and I have been thinking allot about this lately!) But the funniest part of the day was when she asked her Dad if she got to go home with him after the field trip and have her Daddy/Daughter date with him. (She got the idea from the week before. After Breanna got back to the school from Outdoor Ed Matt Cherry brought her home for us, and he and Jared took Breanna and Kaylee out by Lake Pleasant to go riding. So Jodi thought that this is what happens after field trips.) Way too Cute! Here are a couple of pictures that Jared got with his cell phone. I could post more, but I can't seem to get his new phone away from him, he loves it sooo much, he is even texting, something he wasn't really fond of.